Someone I look up to once told me, "let your light shine, tell your story, and help others." 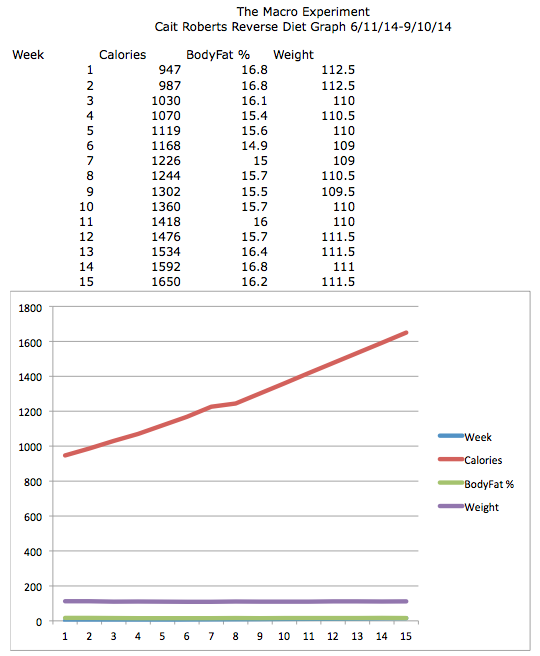 The Macro Experiment Results: So far I have gone from eating 947 calories to 1650 (+700 calories) in 3 months with no weight/body fat gain. I am not a fitness expert or bodybuilding competitor--I’m a regular person just like you. Because of this reverse diet, my quality of life has increased exponentially. I no longer have an eating disorder, I understand how to properly fuel my body, I am building a more desirable body composition, and I eat ice cream every single day. I have absolutely no fear of any food and I NEVER feel guilty for eating ANYTHING. I successfully reversed my metabolism and now I will make a quick and easy step-by-step guide for you. If I can do it, you can do it! *Some people may do better with a coach's guidance and accountability. I HIGHLY recommend Dr. Layne Norton or anyone from his list of reputable coaches. I also highly recommend Alpha Training Protocols, Katie Ringley and BestFitBody. *I’m sure there are different ways of doing a reverse diet. I only know what worked for me and therefore I will teach you exactly what I did. It is up to you if you want to follow my methods or tweak it somehow. It is also up to you if you want to hire a coach. I did not hire a coach and was still able to achieve great results. *Check out the resources section if you want to find out where I spent countless hours putting all these pieces together. Again, I HIGHLY recommend watching Dr. Layne Norton's Video Logs, reading his articles, and listening to his new podcast series--Physique Science Radio. His methods are evidence-based and on point. ***MOST IMPORTANT DISCLAIMER*** I am NOT a registered dietitian, certified personal trainer, or physician. Nothing I say should be taken as medical advice or replace the advice of a physician. I do not intend to diagnose or treat any health condition/disorder. Consult with a qualified physician regarding matters of your health.